I was looking through my food albums this morning to see just how behind I am with blogging, and came across photos from a trip to Korea last summer. I absolutely loved the food that I had every day of that week-long trip, but I think my favorite was the meals that my wonderful friend/hostess's mom made for us. Every dish on this table was to die for. The spicy chicken drumsticks were sweet, spicy and crunchy. I was tempted to lick my fingers, which is saying a lot, as I get quite grossed out by finger-licking. The vegetable seafood pancake was so so so amazing. A pancake without the carbs! How 'bout that! My friend's family made the kimchi (shown in the top right corner) months before. I asked if I could bring a little jar of it home for my family to taste, and on the last day of the trip, my friend's mom presented me with the largest tupperware container I'd ever seen and had split the kimchi into large ziplock bags and even placed ice packs into the container! I should've taken a picture of it. Anyway, it miraculously made it back to Hong Kong in one piece. My family rationed it to make it last as long as possible. 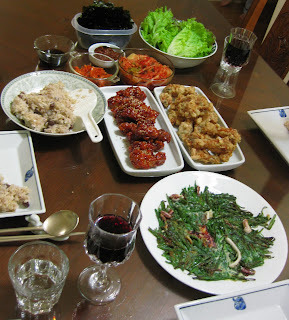 I really need to go back to Seoul/get the chicken drumstick recipe. My mouth is watering thinking about all the food I ate on this trip. Christine, I hope you're reading this!! !